A group of prominent U.S. evangelical figures, including several of President Donald Trump's evangelical advisers, met Thursday with Saudi Crown Prince Mohammed bin Salman, whose role in the killing of Washington Post contributing columnist Jamal Khashoggi remains unclear. In a statement that included smiling photos, the group said "it is our desire to lift up the name of Jesus whenever we are asked and wherever we go." The meeting at the royal palace in Riyadh comes amid widespread questions about the role the prince played in the operation that left Khashoggi dead after he entered the Saudi Consulate in Istanbul on Oct. 2. Allies of the crown prince are trying to rally support for him. White evangelicals have been among Trump's most devoted supporters and have met in recent months with other Middle Eastern leaders whom they see as allies in pressuring Iran. The evangelical leaders believe they will gain more tolerance for Christian minorities in their diplomatic efforts in places such as Egypt, where the same group went last fall to meet with President Abdel-Fattah el-Sissi, and the United Arab Emirates, where they stopped for four days of meetings with top leaders before coming to Saudi Arabia. Group spokesman Johnnie Moore, who also serves as the White House's unofficial liaison to a group of well-known conservative evangelicals, said Khashoggi's killing and other human rights issues were "discussed" Thursday with the Saudi prince. He declined to say more. "The Kingdom of Saudi Arabia is among the wealthiest, most powerful, and most important nations in the Middle East, in all of history," he said. "It also has enormous influence on the Islamic theology taught throughout the entire globe. While the Kingdom is restrictive and controversial in various and serious respects, it has under the Crown Prince begun to undergo reform and professed the desire to change in profound ways. Precisely for these reasons, we thought it was wise to accept the invitation we received from the Kingdom, issued more than two months ago, to come as evangelicals to engage in a dialogue." 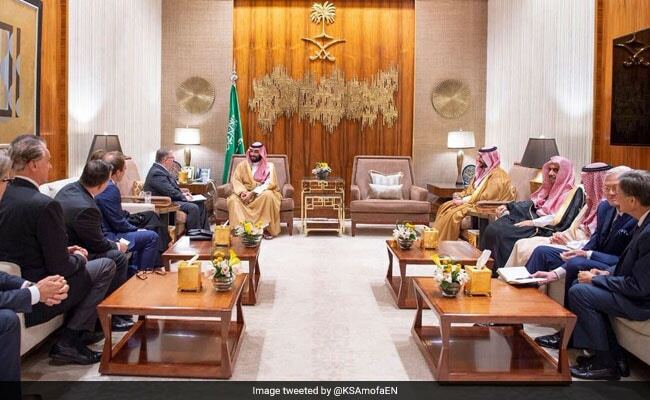 It wasn't clear how long the meeting in Riyadh lasted and how many separate events there were. 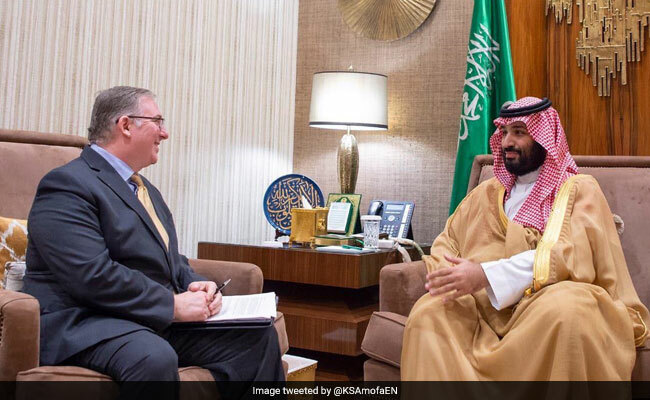 In addition to the gathering with the crown prince, the U.S. group also met with the ministers of foreign affairs, education, Islamic affairs and the government-run Global Center for Combating Extremist Ideology, among others. The American group was led by Joel Rosenberg, an evangelical political strategist-turned-novelist who lives in Israel and writes books about biblical prophesies. Others in the delegation were: former U.S. congresswoman Michele Bachmann; Jerry Johnson, president and CEO of National Religious Broadcasters; Michael Little, former president and COO of the Christian Broadcasting Network; writer Mike Evans; Moore; PR executive Larry Ross; Skip Heitzig, a New Mexico pastor; and former NRB CEO Wayne Pederson. The Jerusalem Post news site framed the group of evangelicals as unofficial ambassadors of an Israeli government that wants to ally with Saudi Arabia in confronting Iran. "In a new sign of growing ties between Israel and Saudi Arabia, the kingdom's Crown Prince Mohammed Bin Salman hosted a delegation of evangelical Christians on Thursday in Riyadh led by a prominent pro-Israel advocate who also lives in the Jewish state," the Jerusalem Post said, referencing Rosenberg. Moore said the group wasn't representing Israel in any way and denied the trip was coordinated with the White House. Moore has been the unofficial organizer and spokesman of the group of evangelical leaders often brought to the White House for consultations and celebrations. "Absolutely false. The White House had no knowledge of our coming and we conveyed no messages from the White House or to the White House," he wrote in an email to The Post. Moore said the group was invited by the kingdom two months ago and was "the latest in a series of relationship-building exercises" between evangelicals and leaders of Muslim and Arab nations. The meetings are meant to take the "long view." The Trump administration and its Middle Eastern allies have been welcoming almost exclusively to a slice of American Christians who share the White House's foreign policy goals. Previous U.S. administrations have maintained diverse religious advisory boards. Critics on social media posted photos of Khashoggi and questioned why the group was there.